March 2, 2013 Nefer Khepri, Ph. D.
If you are familiar with the practice of Feng Shui, the Chinese art of placement, then you will already possess a firm foundation for applying the principles of The Art of Bliss to your home, office, place of business, and your life. If not, then Tess Whitehurst opens her book with a very good introduction to the principle tool of Feng Shui, the Bagua, and how to orient it over the floor plan of any structure in order to rearrange furniture and objects to create as conducive a flow of energy as possible. 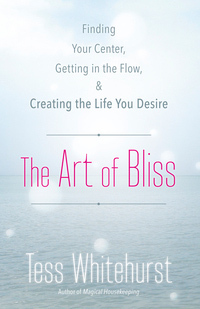 The subtitle of this book is: Finding Your Center, Getting in the Flow & Creating the Life You Desire (original emphasis). In order to help you to carry out these goals the author provides the reader with a number of approaches all grounded within Feng Shui that are easy to understand, implement and follow. The main tool she discusses is the Bagua, which is a map of the nine major areas of life. The book helps readers to learn how each key area works with the others and methods are introduced to help create balance between one area and the next. Such balance will result in positive changes in one’s life. The book teaches the reader how to work with Chi, Prana, & Heka – which are all names from various spiritual traditions for the divine life force that flows in and through everyone and everything. The book is divided into nine chapters with each chapter devoted to a particular area of life (Serenity, Life Path, Synchronicity, Creativity, Romance, Radiance, Prosperity, Resilience, and Synergy). In addition, there is an introduction, epilogue, appendix, and bibliography. The Introduction runs 21 pages long and I do suggest if the reader has no exposure to Feng Shui to pay particular attention to the information imparted in the introduction in order to make the best use of the rest of the material shared in The Art of Bliss. The introduction is very important and lays the foundation for the remainder of the book. Each chapter is organized in the same manner and includes information on the area of the Bagua that governs each area of life and the places in your home, office, or business that corresponds to it. Qualities of each area of life are summarized and this is followed by “Practices” you can follow to help energize this particular area of life that range from meditation and/or prayer to candle burning, affirmations, journaling exercises, symbols you can incorporate into your life and wardrobe that magnify the energy of each area of life, deities, animals, colors, herbs, and crystals. Each chapter concludes with a Key Master Ritual. I suggest you also pay particular attention to the Appendix. In fact, I would recommend first reading the introduction, then skipping to the end to read the Appendix as the two go hand in hand. The Introduction focuses on the Bagua and how to overlay it on the floor plan of your house. The Appendix takes this further. The Bagua assumes your home is a perfect square and it divides the square into nine equal squares, each representing a major area of life. However, not everyone’s home is square. For example, in my home I have three bay windows that give the dining room, breakfast nook and master bedroom a bit of extra wall that juts outward from the rest of the house. This window placement effectively cuts off the outer corners of three areas of my home. The Appendix offers information on what is known in Feng Shui as “cures,” which are things you can add to a room, inside or out, that will create a more beneficial flow of energy so those missing or extra bits to a home’s floor plan will not be an issue where the flow of energy is concerned. For example, a cure I have used effectively is to place a potted plant outside in the “missing” corner. This then energetically draws the walls outward to energetically finish off that corner, making the room on the inside a whole squared off room for a better flow of energy. You can also bury crystals outside, or place crystals inside on window sills, and so on. The Appendix even offers information on how to deal with areas of your home or any floor plan for which a total area of life is missing, like an “L”-shaped building, for example. So, I highly recommend you read first the Introduction then skip to the Appendix. Now, I will tell you that the approaches offered in this book work even if you do not follow through and Feng Shui your home for an improved flow of energy. I’ve tried several of the recommended exercises and also a Key Master Ritual and have gotten what I would consider to be fair to really good results. I’m a clutterbug so I did not go through and Feng Shui my home first. That would take way too long and I wanted to see if any of these ideas presented in The Art of Bliss would work, so I skipped all that and jumped right in. I’m sharing this so you will realize you do not have to go through and Feng Shui your entire home first. HOWEVER, I am sure that the practices, exercises, and rituals would be much more effective if I did go through the work of applying the principles of Feng Shui to my entire home. I did this once before when my husband and I were just starting out and renting an apartment in a very negative apartment complex. I applied Feng Shui principles to every nook and cranny. This greatly increased our sense of peace and harmony in our home there, plus it helped with our prosperity as well. So I know from personal experience Feng Shui works. Since getting this book I have cleared up the clutter downstairs so I am now ready to apply the Feng Shui cures and principles to that area of the house. Now to tackle the 2 bedrooms, the loft, and my office upstairs, but that’s a whole other project best saved for a very boring rainy day. I highly recommend The Art of Bliss. Tess Whitehurt’s author’s voice is very conversational and in many places the book reads as though she’s right there explaining everything to you one-on-one. The book flows well, is very easy to understand, and in total it’s a good read, plus you will learn the introductory information you need to start applying Feng Shui to your life as well as learn some very useful practices, exercises and rituals. I also highly recommend Tess Whitehurt’s earlier book, Magickal Housekeeping, also published by Llewellyn Publishing. It will inspire you to seriously clean your house. No kidding! Next How to Connect with Your Animal Totem Spirit.